On 27th March 1948 newborn Pakistani state attacked and forcefully annexed the sovereign Baloch state on gunpoint, since the occupation of Balochistan in 1948 Baloch people have been observing the 27th March as a black day. From the very day of forcible occupation, the Baloch resistance movement has started and it was led by Agha Abdul Karim Khan, who was then the governor of Makoran state and younger brother of Khan of Kalat (Balochistan) Mir Ahmed Yar Khan. Historically Kalat was capital of Balochistan, And Balochistan was called Kalat State, whereas Jhalawan, Makoran, Kharan, and Lasbela were provinces of Kalat state. Even though the Rulers (Walis) of states met with Mohammad Ali Jinnah and merge theirs states with Pakistan but these provinces had no legal or constitutional rights to annex with Pakistan, because these provinces were under direct control of the Kalat state and governors were appointed by Kalat the central government and the Wali’s were also members of the upper chamber (Aiwan e Bala) of Kalat state. And they had already taken the oath from the assembly for safety and sovereignty of Balochistan. 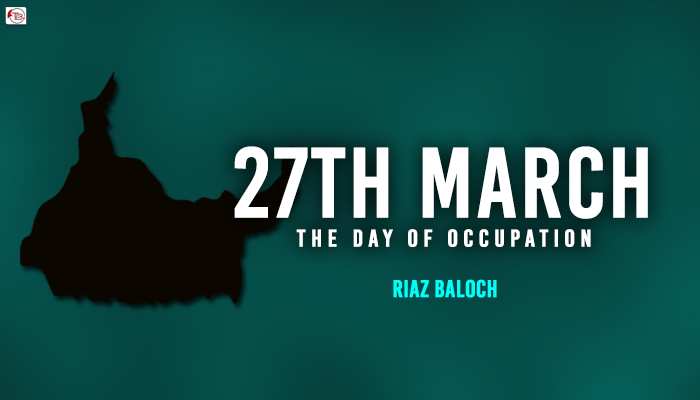 27th March has been observed as a black day by Baloch nation, they protest, they hoist black flags on their houses and wear black, hand bands to express the hatred against the occupation. Pro Freedom political parties stage protest and arrange awareness campaigns and seminars in Balochistan and worldwide to highlights Pakistani atrocities in Balochistan. Baloch have been fighting against slavery and for the sovereignty of their homeland Balochistan since the first day of Occupation, Baloch have fought five wars against Pakistan to regain the sovereign state of Balochistan but Pakistan quelled those insurgencies with the help of China, neighboring countries and used the U.S supplied weapons and jets against Baloch insurgents. The new ongoing insurgency; which was started two decades ago, said to be the most powerful and ideological Baloch movement. Thousands of Balochs have been killed and thousands are forcibly abducted in military operations since 1948. Houses are being burned; livestock and other assets are being looted on a daily basis in military operations. Balochs have never accepted Pakistani slavery and they have been struggling for their self-determination, however, there have been ups and downs in the Baloch national liberation struggle. It is time for Baloch nationalist organizations and leadership to be united in Balochistan and abroad to expose Pakistani war crimes in Balochistan. Every Baloch living abroad is a representative of his nation.